The New England Patriots Josh Barrett donated $1,000 to President Obama’s reelection campaign. They are some of the best known, highly paid people in the country, whose opinions are documented continuously by the press and consumed ravenously by the public. But unlike others with similar wealth and influence, professional athletes seldom venture into politics, generally keeping their views and money on the sidelines this election season. In Boston, only one of 188 players listed on the rosters of the Red Sox, Patriots, Bruins, and Celtics has made a political donation during the current presidential election cycle. Josh Barrett, a reserve defensive back for the Patriots, has given $1,000 to President Obama’s reelection campaign, according to a campaign finance database maintained by the Center for Responsive Politics. Meanwhile, owners of all four major clubs have given generously to federal candidates and committees. 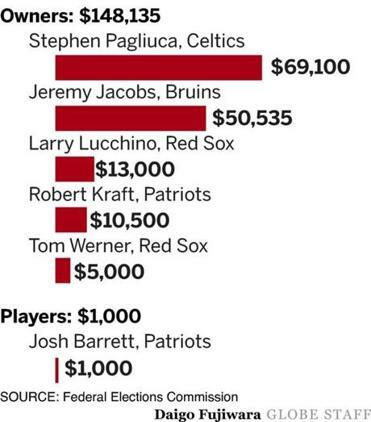 Larry Lucchino of the Red Sox and Stephen Pagliuca of the Celtics have donated the maximum allowed to Obama. Patriots owner Robert Kraft has, too, while giving $500 to presumptive Republican nominee Mitt Romney. And Jeremy Jacobs of the Bruins has contributed $3,500 to Romney. Bruins goaltender Tim Thomas paid a price in January when he refused to join his Stanley Cup-winning teammates on a visit to the White House, writing on his Facebook page, “I believe the Federal government has grown out of control, threatening the Rights, Liberties, and Property of the People.’’ Just months after Thomas was named the NHL’s best goalie and the most valuable player of the playoffs, some fans wanted him to be traded. Sports agents warn their clients about such backlashes and often advise them to remain politically neutral. But if an athlete risks alienating fans by opening his wallet or taking a public stand, he faces no such danger by casting a ballot in the privacy of a voting booth. Yet, the culture of sports does little to encourage even the most basic form of civic participation. “Political engagement is fostered over time, and a lot of athletes miss out on opportunities to build that because of the control their coaches or athletic programs have over their time and focus,’’ Davis said. There have been no major studies of professional athletes’ voting habits, but anecdotal evidence suggests turnout is low. The NFL, NBA, and NHL all are in season in November, when presidential elections are held. With busy travel schedules, the only way for many players to vote is by absentee ballot. Former linebacker Matt Chatham, who played eight NFL seasons and won three Super Bowls in six years with the Patriots, recalled voting by absentee ballot in South Dakota during his playing days but noted that politics rarely came up in conversations with team personnel. The Patriots, Celtics, and Bruins said they have no programs to help players obtain absentee ballots and do not actively encourage them to do so. When athletes do enter the political arena, it is often after retirement - and their efforts are frequently devoted to promoting their own candidacies. Notable players-turned-politicians include Bill Bradley, a basketball Hall of Famer who served three terms in the Senate and ran for president in 2000; Jack Kemp, who won two American Football League titles with the Buffalo Bills, served 18 years in the House, and ran for president and vice president; and Jim Bunning, a baseball Hall of Famer who represented Kentucky in the House and Senate. There was a time when active athletes were more willing to deliver political messages, said Dan Lebowitz, executive director of the Center for the Study of Sport in Society at Northeastern University. He pointed to John Carlos and Tommie Smith, who raised black-gloved fists on the medal stand at the 1968 Olympics, and Muhammad Ali, who a year earlier refused to fight in Vietnam. For Ali, the price was a three-year ban from boxing; for Carlos and Smith, it was decades of scorn. Carlos’s first wife committed suicide in 1977 partly, he has said, because of the prolonged public outcry over his “black power’’ statement. The stakes are much lower for today’s athletes, but most subscribe to the Jordan philosophy, Lebowitz said.